As a commentary on today’s world where most of us are in a zombie like state staring at our electronic devices instead of interacting with those around us, Cell is a meaningful look at what we as a society have become. As a commentary on today's world where most of us are in a zombie like state staring at our electronic devices instead of interacting with those around us, Cell is a meaningful look at what we as a society have become. As a movie based on a Stephen King Novel of the same name, it is a horrible mess that makes little sense. It's taken about 20 years for the film to come to fruition and there is a reason. Frankly, I'm not sure it ever should have seen the light of day. Clay (John Cusack; High Fidelity) is a separated father of one who was dissatisfied with his life and decided to quit his job, leave his home and concentrate on writing the next great graphic novel starring a red hoodie clad zombie like humanoid (it becomes important later). At the airport, after a successful business trip, things suddenly become strange when everyone around him starts hurting each other and become zombies. Clay meets up with other non-"phoners", including Tom McCourt (Samuel L. Jackson; The Hateful Eight) and Alice Maxwell (Isabelle Fuhrman; Orphan), in order to try and stay alive and make it to his wife and son in New Hampshire. Over the course of several days, they discover the phoners are actually adapting and "rebooting" in order to strengthen their signal and their numbers. Those who are not affected suddenly also start having nightmares with visions of the not so friendly red hoodie villain of Clay's graphic novel. Confused yet? Yeah, I hear you. With a terrific cast, I had hopes for the movie but even they can't save it. Cusack is his usual top notch self and Jackson plays McCourt as only Jackson can. Fuhrman manages to keep up with these two veteran actors despite her relatively young age. A cameo by Stacy Keach is also a nice and welcome surprise but he is in the film for such a short time that it doesn't make that much difference overall. The screenplay by Adam Alleca (The Last House on the Left) and Stephen King (11.22.63) should have been a no brainer but it is, sadly, not great and certainly not up to what one would expect from King. The story doesn't flow and the dialogue is overused much of the time. I'm surprised King let this film get made without numerous rewrites but, again, this film has been in development for the last 20 years and maybe he just wanted to move on from it. Twenty years ago the zombie angle would have been fairly fresh but in 2016 it is just worn out. The plot is the biggest issue, as it doesn't make any sense. There is no explanation as to why or how the "outbreak" occurred, nor what the Red Hoodie character has to do with anything. The ending is three different scenarios, one of which would be logistically impossible if the (spoiler alert) bomb actually detonated and made me wonder if this was all just a dream Clay was having, but even that wasn't resolved. The film dragged in the beginning, only to pick up some in the middle, and almost caught my interest, to finally break apart again at the end, voiding it of any chance of being remotely redeemable or likable. The Blu-ray is presented in the usual 1080p high definition video with a 2.40:1 aspect ratio, which made the video at least pleasant to look at for much of the film, although the mass napalm scene was obviously very fake. The DTS-HD 5.1 Mater Audio was actually very good with a range across the spectrum and a mix between dialogue and fight scenes that wasn't offensive. The surround sound was particularly well done, so I suggest watching it with a home theater system. 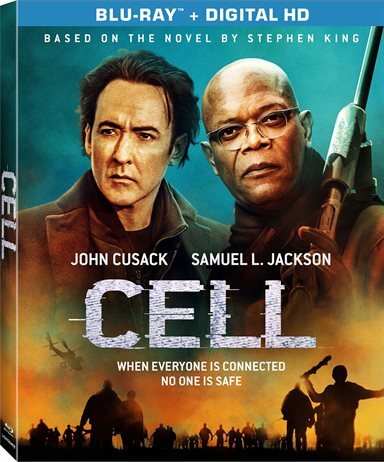 There are only two extras on the Blu-ray including audio commentary with the Director and a behind the scenes feature called To Cell and Back: The Making of the Film (clever), which takes a look at the cast, stunts and makeup. Even with a great cast and a strong writing team, there was no salvaging this film. I alternated between confusion, boredom and outrage at the stupidity of it all. It's such a shame this wasn't more interesting and didn't resolve any of the questions I had, because it certainly had potential. If you live (pun intended) for all things Zombie, then go ahead and check it out; but, otherwise, your time can be better well spent. Download Cell from the iTunes Store in Digial HD. For more information about Cell visit the FlickDirect Movie Database.